The single-platform ACTV station is in a quiet area of Castello near the very pleasant San Francesco della Vigna Church, which is worth a visit if you're in the neighborhood. We don't know of any hotels in the immediate neighborhood, but a modern one-bedroom vacation apartment, the Sagredo Suite, is close to the Celestia boat stop. 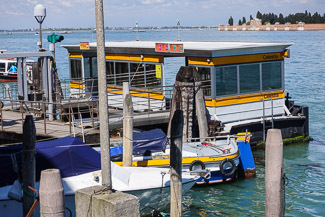 Note: This station does not have a ticket booth or vending machine, so here's what to do if you need to board a water bus without a valid ACTV ticket or Tourist Travel Card.